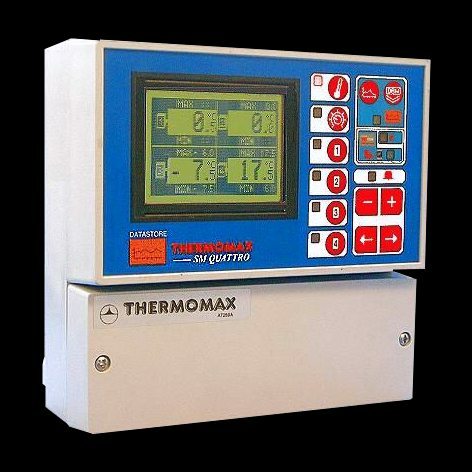 The SM QUATTRO microprocessor-based datalogger with 4 fully sealed plug-in PT100 platinum film sensors uses the novel approach of a paperless logging and filing system, which allows the data of any day in its history to be read and examined with just a few key presses. Percentage of internal databank used' indication in bar graph and digital form. Contents of internal databank can be transferred directly to the PC using the MASTERLINK Software or via a MASTERLINK 2.0 Hardware module to a PC at a remote site. Stage 1 temperature threshold with trigger delay. Stage 2 limit temperature with immediate trigger. Status window for system fault indication. Diagnostics screen revealing system parameters. 2-Stage high and low level alarms with mute and reset facilities.